Relax. The Rest Comes Easy. 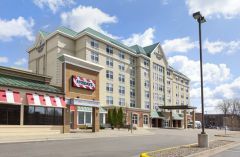 Literally steps from the world-famous Mall of America and just 20 minutes from downtown Minneapolis and St. Paul, our hotel in Bloomington provides quick and convenient access to Bloomington area shopping, dining and more. With a brand new look after a full renovation, the Country Inn & Suites® by Radisson, Bloomington at Mall of America, MN provides a beautiful, welcoming atmosphere where you can relax after a long, enjoyable day. Relax in one of our two pools or whirlpools, or simply unwind in your room during your downtime and watch a movie on our flat screen 42" HDTVs. Don't forget to stop by our breakfast room from 6:00 to 9:30 a.m. to enjoy our enhanced complimentary buffet breakfast with hot items rotating daily. If you have any questions, call +1 (800) 456-4000 US/Canada toll-free or contact the hotel directly at +1 (952) 854-5555. Available for stays from May18, 2019 to May 25, 2019.